This card uses the faux stitching technique. 3. 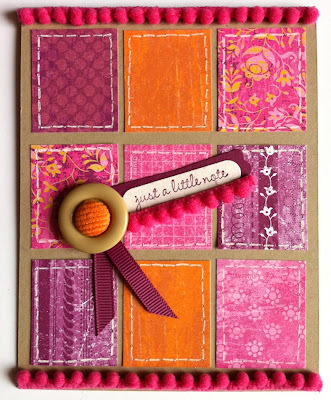 Use the stitch template to poke holes in the small rectangles. Very fun card Deb. The pompom trim really adds a punch. Might be fun to use Pinking shears on the paper too for a fabric look to go with the faux stitching. Love the gel pen - such a cool tool.